The murder of Elizabeth Short has haunted the Los Angeles Police Department since the heinous crime was committed in 1947. The reason will undoubtedly surprise many. The truth is: L.A.P.D. knew who killed Elizabeth Short; they had him, they grilled him, but they did not hold him. This site tells the story of the last days of Elizabeth Short, known in life and in death as the Black Dahlia. It reveals the name of her alleged killer, deciphered from cryptic messages he sent to the L.A. Examiner and L.A.P.D. over 50 years ago. Elizabeth Short hailed from Medford, Massachusetts. She quit school at age 16 and became a drifter. During the last four years of her life, she floated from Massachusetts through California, through Florida through Indiana, and into Chicago where she boarded a train and rode to the Union Pacific station in Los Angeles. Soon after her 1946 arrival in LA, Elizabeth was tagged "the Black Dahlia." Her moniker was earned because of her raven locks, penchant for wearing black, intriguingly obsessive behavior and the release of Raymond Chandler's The Blue Dahlia as a motion picture. The Black Dahlia murder has been a baffler. It is the most infamous unresolved homicide in LAPD history. But the solution to the Dahlia murder has been "there" for LAPD Homicide and the LA public for more than a half-century. This is a paradox with a simple explanation: the solution was shrouded in black symbolism, abstruse encryption, plus a plethora of reportage. For over 50 years, the murder of the Black Dahlia, Elizabeth Short, captivated the interest of virtually everyone familiar with the case. Within this site are the details of the life of Elizabeth Short and her gruesome and premature death. Through the deciphering of clues intentionally left by her killer, the Black Dahlia's murderer is revealed, along with his twisted motives and methods. 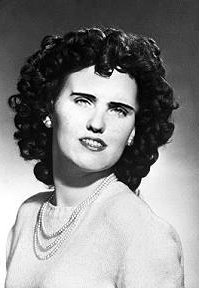 This site is dedicated to the memory of Elizabeth Short, the Black Dahlia, and to the truth about what happened to her in her final days.